I really like doing origami with fabric. 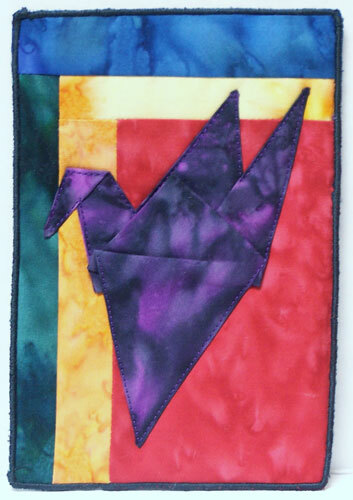 This is a crane I came up with a few years ago, making a wall hanging for friends for the wedding, and experimenting on a baby quilt for the same couple. I omit a couple of folds to keep the bulk down, and it gives it a bit of a unique look. I’d like to be able to make them smaller, but the corners get tricky and I haven’t found a starch I like. This is my favorite of these three. The pattern lends itself well to fabric, since all of the raw edges end up folded under. The points are still tricky. 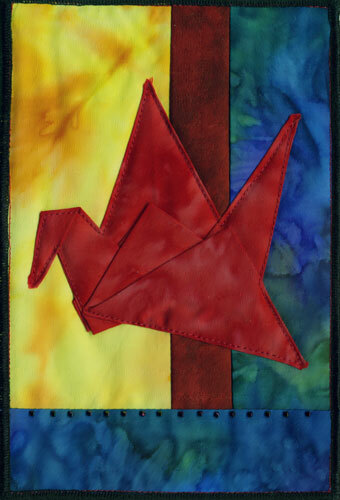 I had to manipulate this photo to get the colors to come out right — the red is the same fabric as in the crane above. There are three long raw edges on this one, so I do wonder how they’ll hold up even with the close quilting/applique. The beads also serve to anchor key folds down onto the backing. I’ll be doing some more experimenting with this pattern, or looking for a better one. I need to find a faster edge finish, to keep the price point down on these. I love the way this looks, but it’s two passes with a very short stitch length, which takes up a lot of thread and is time consuming. 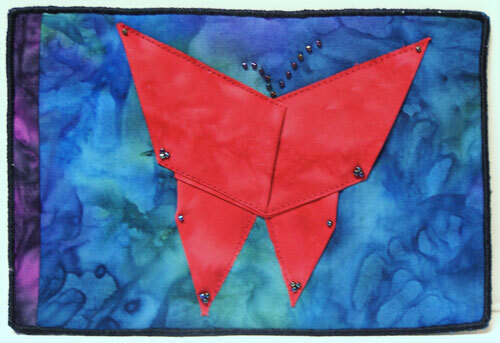 Origami fish fabric postcard, all cotton, backed with watercolor paper, with triangle delica bead accents. I’m experimenting with scanning these smaller pieces rather than photographing them, which is giving a much more realistic representation of the colors, but not as much sparkle on the bead accents. The “bubble” beads on this fish are matte, but the ones on the eye are shiny. 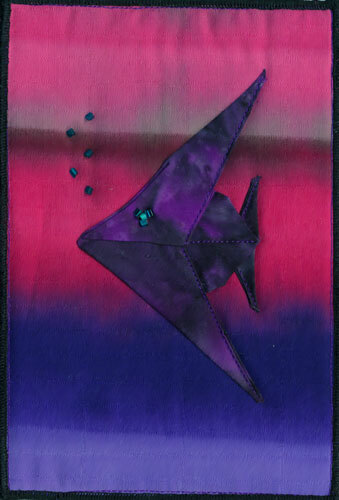 Origami crane fabric postcard, all cotton, backed with watercolor paper, with delica bead accents. I have a new edge technique after the last ones — a double pass of my serger with a three-thread overlock hem stitch, once with the right side up and the second time with the wrong side up to fill it in. The corners aren’t as perfect as I would like them to be, but I’m working on them. 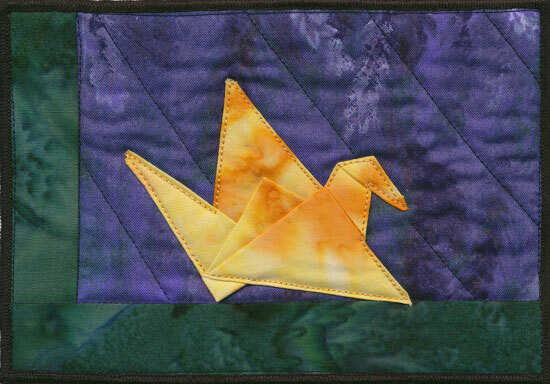 Origami crane fabric postcard, all cotton, quilted and backed with watercolor paper. This one has a quilted background, instead of any beading accents, because I wanted to sink the blue fabric down a bit. I like how it turned out. 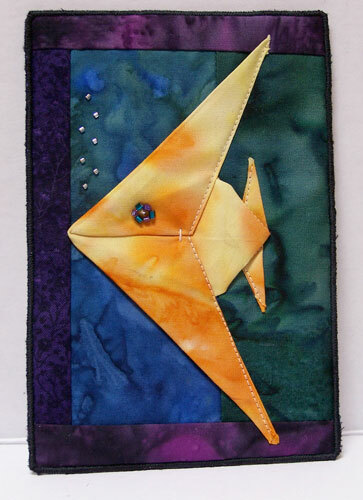 Origami crane fabric postcard, all cotton, backed with watercolor paper, with bugle bead accents. 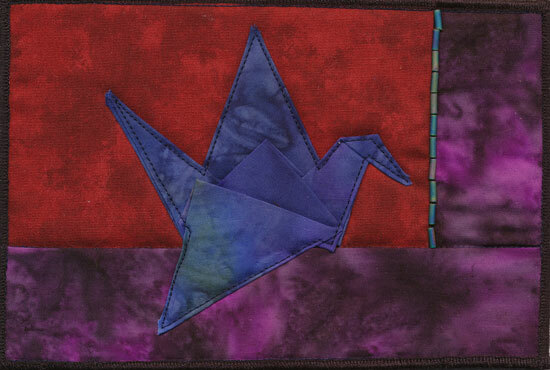 I love these colors, but the crane didn’t really pop out of the purple until I added the bugle beads along the border. Now I’m happy with it.